You are here: Home / Events / Jack Nicklaus Visits the Villages! Jack Nicklaus Visits the Villages! A “Lesson with the Legends” and a Veterans Tribute Concert will be held on the Polo Fields at The Villages on October 21 from 1 pm to 4 pm. PGA professionals Jack Nicholas, David Duval, Jim Furyk, and LPGA professional Michelle McGann will be on hand for the event, and there will be audience participation with golf tips, stories, and more. Also on hand will be Charlie Rymer from the Golf Channel, and Catherine Herridge from Fox News. A concert to honor Veterans will follow the golf portion of the event. All proceeds raised will go to Combat Veterans to Careers, and K9’s for Warriors. For more information, contact Combat Veterans to Careers, a 501c3 corporation, at 352-255-1179. 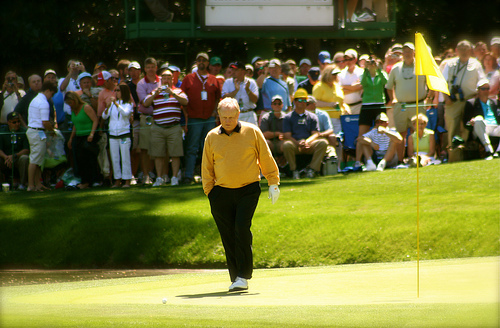 Don’t miss this wonderful opportunity to help Veterans and see the ‘Golden Bear” in person.